In Ballad of Buster Scruggs, the Coen brothers' sequence of six short filmed Western tales made for Annapurna Television and then sold to Netflix, free of studio pressures, they have sculpted every segment with the precision and care of miniaturists. Though uneven and varied, they strike a balance, wielding oater clichés like hangings, saloons, nowhere towns, wagon trains and gunslingers in such an original and skillful way as to seem classic, justifying the film's inclusion in the 2018 New York Film Festival's elite Main Slate. The narratives are dark and nihilistic. The degree and nature of the violence varies, always lodged comfortably in a dryly pleasing world where we can be secure in the knowledge that there is no hope. 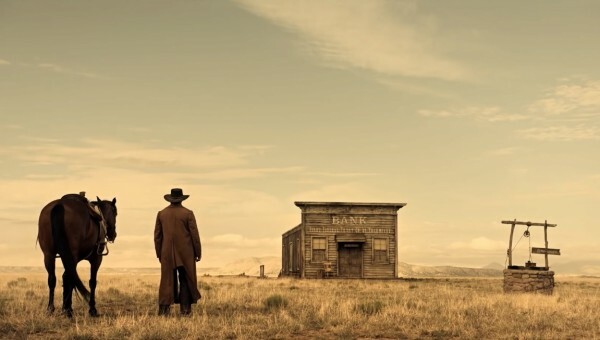 At first, with the titular opening segment starring Tim Blake Nelson as s a singing traveller in the Wild West who polishes off any and every opponent with alarming dispatch and nonpareil skill as a gunslinger, the extreme lawlessness of the times is paramount. In "Near Algodones," an incompetent bank robber (James Franco) escapes from being hanged, but that turns out to be false fortune. Not everyone is dispatched with a bang,. Witness "Meal Ticket," where an itinerant impresario (a grizzled Liam Neeson) finds that his novelty showpiece, an oratorical armless and legless Englishman (who recites poems by Shakespeare and Shelley and Lincoln's Gettysburg Address), now no longer a draw for rural audiences, has become like dead weight. A grim world indeed and a mutually dependent duo who alone would justify reviews hat compare this movie to Beckett. A lonely gold prospector's lucky find isn't so lucky after all in "All Gold Canyon," an episode for its subtly dazzling depiction of western natural beauty and the pleasure of seeing how well Tom Waits can fill up a screen, but the deer and the owl have the last laugh. The brothers seem to have crafted every leaf, every drop of water and white hair on Wait's face and every crater on the pockmarked mug of the parasitical young villain who comes after him (Sam Dillon). Because it's mostly nature, the calculated artistry doesn't seem fussy. This tale is like a succinct version of "The Treasure of the Sierra Madre." A certain delicacy, and a feminine point of view, enter the scene with "The Gal Who Got Rattled." Miss Alice Longabaugh (Zoe Kazan) mounts a wagon train with her short-lived and incompetent brother, Gilbert (Jefferson Mays), where the issues of debt and marital status are paramount. A way out appears when the handsome wagon driver Billy Knapp (Bill Heck, a find) grows interested. But a tragic mistake occurs during an attack by Indians. Like the other episodes, this ends with bitter irony. But it contains soft and touching moments. People die aplenty in every episode of the Coens' collection, and any happy expectations of a positive outcome die with them. But no animals are harmed in the making. And, happily, no contractions are uttered, never an "isn't," "don't," or "wouldn't." A formality is maintained that simulates nineteenth-century speech. This quality is used effectively to convey Billy Knapp's and Miss Longabough's growing respect and affection for each other. The sequence of Arthur, Knapp's wagon leading partner, fighting attacking Indians as Miss Longabough looks helplessly on, is wonderful visually, closely resembling classic western paintings. The sweet sadness of this most admired of the segments lingers. This touching, complex episode counters any feeling that the Coens are merely indulging in tongue-in-cheek nihilism. This is also one of the triumphs of this first Coen brothers foray into digital imagery, and the production values, including the costumes and the wrangling of oxen in the wagon train, are very impressive, indicative of what a challenging film this was to make. The Coens have said "It wouldn't have hurt if we were younger" (they're 59 and 62). Most of these episodes are stories the Coens themselves wrote over many years, except that "All Gold Canyon" is based on a Jack London tale, and "The Gal Who Got Rattled" comes from one by Stewart Edward White (1873-1946). We see the tales at the outset and conclusion of each as the pages of an old book - you can read them if you're fast enough - prefaced by an illustrative plate in an old fashioned style like that of Andrew Wyeth's father, N.C. Wyeth. This contributes to a solemn, staid, period flavor, a cozy distancing effect that tempers the Western violence. The last episode, "The Mortal Remains," shot, in contrast, entirely on a sound stage, may evoke Tarantino's recent The Hateful Eight, since it focuses on a group of people in a stagecoach. Four men and one woman are the riders, two of the men bounty hunters, and one of them is Brendan Gleeson, the other Northern Irish actor Jonjo O’Neil. The Frenchman (Saul Rubinek), the prim and superior lady (Tyne Daly), and the grizzled trapper(Chelcie Ross ) fall to squabbling, till they are brought short by a haunting song sung by Gleeson. The images turn to monotone, and the meanings grow to grimly symbolic. Fort Morgan, the coach's destination, seems to be the end of the line in more ways than one. "Mortal Remains" seems like an unusually well-crafted "Twilight Zone" episode.